We’ve added this EzineArticles team member just for you! Over the past decade+ our team has delivered hundreds of educational tools to help you write and market yourself and your business with quality original articles. However, I’ve often heard from our members that we either provided too much content or didn’t provide enough of a road map from A to Z. It’s also equally important that you know how to use the tools and are able to put them to use in the most efficient and effective manner possible. Over the years, we’ve listened to your feedback and provided training on everything from utilizing our suite of writing tools to integrating social media into your overall strategy. Anytime you brought us a training need, we answered it with a combination of blog posts, videos, newsletters, and emails – not to mention a multitude of teleseminars and webinars. As a result, we’ve amassed an incredible wealth of knowledge on the topic of article writing and marketing … 11 years worth of expertise and experience! The trouble is that nobody has ever taken the educational materials, along with the data gained from 50 million monthly visitors, and combined it all into one start-to-finish article marketing system designed solely for your benefit … until now. 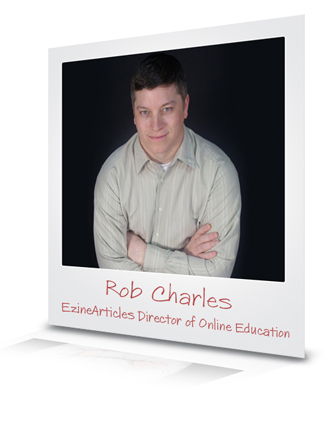 Meet Rob Charles, the newest member of the EzineArticles Team. As the Director of Online Education, Rob’s been charged with doing something that’s never been attempted before: Creating an article writing and marketing training system based on the proven EzineArticles formula. A step-by-step program, designed for both newbies and veterans alike, that literally walks you through everything you’d need to know to become a true article marketing whiz. This will be a fee-based program for those who want to maximize the return on their time. In the next few weeks we’ll be rolling out this new training system and making it available to all of our members. We’ll also continue to provide an ongoing stream of free training, just like we always have. Sticking with that theme, I asked Rob to share a few tips that’ll help get you started right now. Watch “8 Steps to Writing and Submitting Your First Article” – This video is a great way to get yourself moving down the right path toward article writing and marketing success. Learn the Editorial Rules – Our Editorial Guidelines are the rules that govern what can, and cannot, be contained in your articles. The sooner you learn these, the sooner you’ll be writing articles that get approved on the very first try. Peruse the Blog – The EzineArticles Blog is packed with information that every aspiring Expert Author should know. Spend a few hours (or a few days!) reading the latest posts and watching the videos. Don’t forget to check out the comments as well. The EzineArticles community is a great source of education and inspiration. And don’t be afraid to chime in and become a part of the community yourself! Plan Ahead – Before you write your first article, think about your expertise and what specific wisdom you can bring to your readers. Then draft a list of articles that will share this wisdom. Finally, jot down an outline of each article to be sure you’re delivering the information in a clear, concise manner. Just Write! – Sometimes the best thing you can do is just get started. Accept the fact that you’re going to make mistakes, but that you’re also going to learn a lot along the way. Don’t expect perfection – just write! You can find out what others have to say about EzineArticles, and the benefits of article writing and marketing, by checking out our Endorsements page. It’s loaded with testimonials from people just like you who have seen huge benefits from using our system. Over the coming weeks, we’ll keep you posted on Rob’s progress. In the meantime, help us serve you better by filling out this brief 3-question survey. It’ll go a long way toward helping us build a program that’s perfectly suited to your needs. Do you have tips, techniques or success stories that Rob could integrate into the new training package? Please leave a comment to share them with the rest of us. Something that helps me is to pick a goal with how many readers I want to get each month. This then becomes another challenge to write more and better articles. And when you reach the monthly goal…Yahoooooooo! Last month I did and my son treated me to an ice-cream beside the beach when the Parrots came home to roost in the evening. It was gorgeous! This is great to know. It will be helpful in everything setup and organized in one place. Although, I do not have any suggestions at this time thanks for the update. How about a class or series on how to post on EzineArticles with the least possible frustration/tips and tricks for getting your articles posted on the first try. This is something we are always working toward. Great suggestion! Building the brand – that’s the part I am after now. Looking forward to that. On the other hand, posting the article faster is a challenge. This very moment I am fighting with the error message ‘Your Body contains invalid characters. They will be replaced with equivalent characters.’. Finding the invalid character is not a problem, eliminating it -still is. Try writing a 500 word piece on team development while keeping the use of the words “team” and “teams” under 6%. It really affects the clarity and cogency of the piece. Apart from that, I’m delighted with the way EzineArticles looks after its authors. The rule is in place to prevent the spammy keyword stuffed articles from passing & we needed to hard-line rule it. But like you said, it may be difficult at times to meet it. If there are examples you want us to review, send them our way and we’ll be happy to review them again. I agree with Leon on the 5-6% rule. If you could examine the short/long keywords rule for “Online Casinos” , “USA Casinos”, “USA Players”, I think you will see the difficulty since so many of these keywords “overlap” creating an excess of density. No matter how good the content is, improved organization always makes it better. Look forward to seeing what you will be offering. Welcome Rob. Thank you for your tips, i just found this site, trough a friend and he is writing here sometimes, I will try today, I really love write articles, is very nice expression method. Thank you very much! I am looking forward to your training – I watched and studied the 2 minute tips in getting my articles accepted. They were very help full, all my first ten articles accepted first time. Thanks for the welcoming comments and feedback. I am so excited about this training tool I am working on, and can’t wait to share it with you. You will receive more detail on it over the next couple of weeks inside of our newsletter, and you can always follow me on twitter @robcha35 for more tips and details on any training tools that we make available to you in the future. This is a great idea! We will be sure to cover this within the training tool we are on the verge of introducing. Your email support on how to write should be required reading for high school English classes. You don’t try to sell me anything. You make me a better writer for today’s market. I live in San Diego where English speaking people don’t. How’s that for a sentence? I am truly encouraged by EzineArticles’s having an article writing and marketing training program under the Director of Online Education. I never knew I really had the ability to write until I worked part-time for an SEO specialist who recognized and allowed me to develop it in conjunction with his marketing consultancy projects. In one of these, in addition to blog commenting duties, I became a ghost writer, instrumental in attaining in behalf of the client the status of Expert Author. I do have one request for the highly anticipated “Training Tool/Lessons”. Could you PLEASE add a “Print Article” link so we can print them out….without printing all the comments! Thanks for your feedback. I wanted to clarify something. What I am working on is not going to be posted here on the Blog like you are accustomed. Instead this is going to be a fee-based modular training system that covers Article Writing and Marketing from A-Z. It’s designed for those who want to take the next step. More details on this training tool should come out later today. I’m having a problem. I keep getting the message that the title doesn’t match the content but it does and when I try to fix it and resubmit, I get the ‘invalid character message, even though i have cut and repasted it several times with pure unformatted text straight from a notepad file, and when i click ‘fix now’, your word processor adds several carriage returns between my paragraphs, and when i delete them, I keep getting the ‘invalid…’ message. It’s an endless loop and I can’t get the article past this process! Most often, you can cut/paste the language into a plain text editor and it strips anything that you may not know is there. I reviewed your article and the article body is where the hidden characters are, not in the title. I would recommend stripping all HTML attributes by pasting it in a plain text editor. Paste it back into the submission form and add any attributes you would like to see. I did exactly that. I cut, then pasted the entire article into notepad and then repasted into ezine and reformatted in the ezine editor and it keeps saying I have invalid characters and when i tell it to fix them, it adds a bunch of paragraph returns, and then (it seems to be related) not only that, but regardless of what I change the title to, I keep getting the message that the title doesn’t match the content, which it certainly does. The article is #5278863. If you could take a look and see if there’s a content problem or if you could delete the article so I can start over again. This is the only time this has happened but it refuses to be fixed. Great Article! Welcome Rob. I look forward to more great Ezine info. Thanks Bob! We look forward to providing you with more great EzineArticles information and training tools in the near future. I too am having “invalid characters” on the body of the article. I did -1.erase the article from the body. -2. Saved the empty page -3 pasted the article in the clipboard/notepad -4. copy to the article in Notepad -5. pasted the article in Body using the Plain text button. I am still being flagged for the “”invalid characters” in the body of the text. How do I correct this? If you have any further questions please feel free to contact our Member Support Team via the ‘Contact Us’ button inside your My.EzineArticles account.